Mary Queen of Peace is located in an affluent neighborhood within Mandeville. It is part of a large compound that includes classroom buildings, music rooms and community center. Exterior lighting is fluorescent lighting within decorative vandal resistant fixtures. The stained glass is backlit from within the narthex of the church. The stained glass lights can not be seen from the inside but illuminates the stained glass beautifully from the exterior. These lights are circuited with the exterior lights and automatically turns on in the evening and turns off in the morning and is a beacon in the community. The interior lighting is mostly fluorescent for energy efficiency and long lamp life. Decorative box lights are cleverly used at the front and rear of the church for a beautiful and stylish effect. The pendants look custom but are standard fixtures and have striking rosewood bars on the side of the vertical cylinders. The egress lights are completely concealed and open at loss of power illuminating a path of egress. 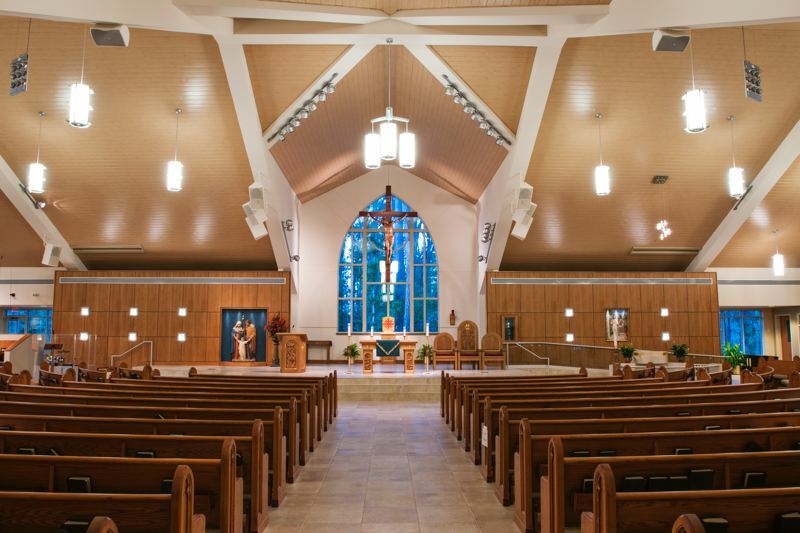 Incandescent lights are used for the sanctuary and the choir area for a natural and controllable effect. All fixtures can be maintained from a 12 foot ladder for easy maintenance. The selection of fixture and their placement indicate a careful thought that goes into the design of each of our projects resulting in a beautiful and functional facility with which the owner will be pleased and proud.